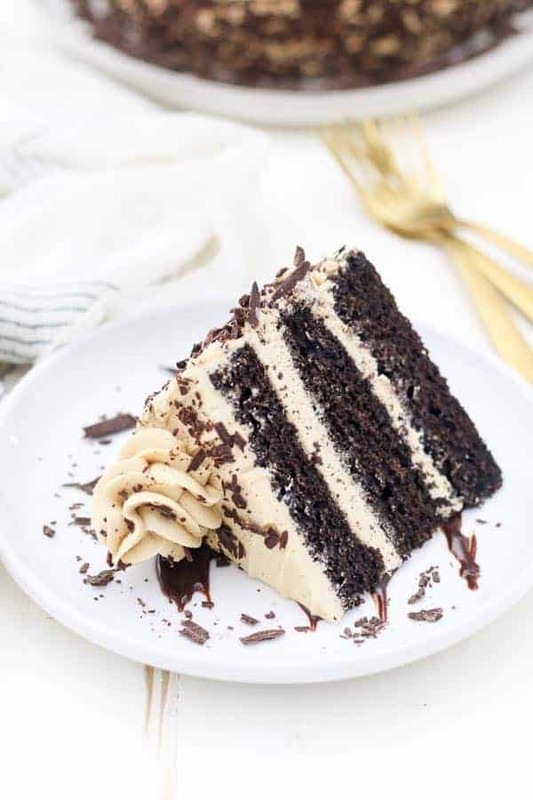 This Chocolate Mocha Cake is a 3-layer chocolate cake with a coffee infused buttercream. 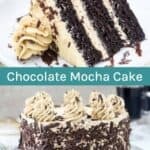 The moist chocolate cake is made with a dark brewed coffee and covered in a mocha frosting and chocolate shavings. Twenty nineteen must be the year of chocolate cakes, I just can’t get enough. I am obsessed with my moist chocolate cake recipe, so it’s not so surprising how many different chocolate cakes I’ve made recently. 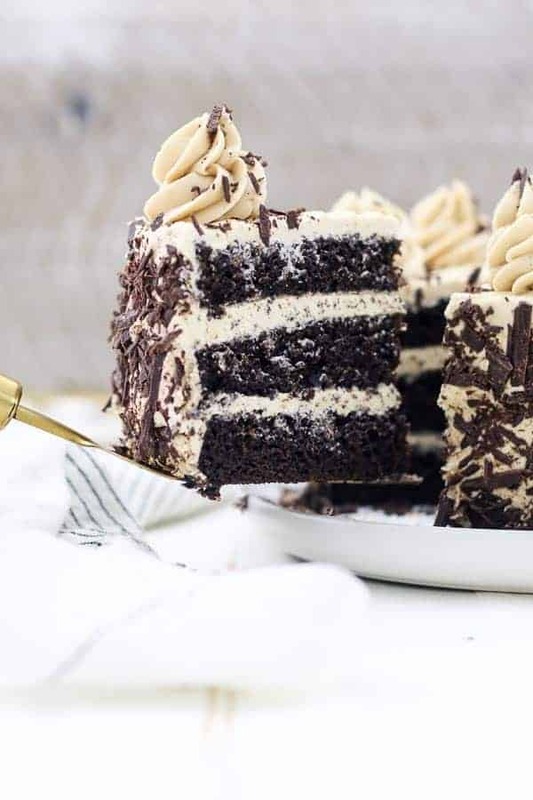 I’ve actually been holding onto this Chocolate Mocha Cake for a while, but can you blame me? 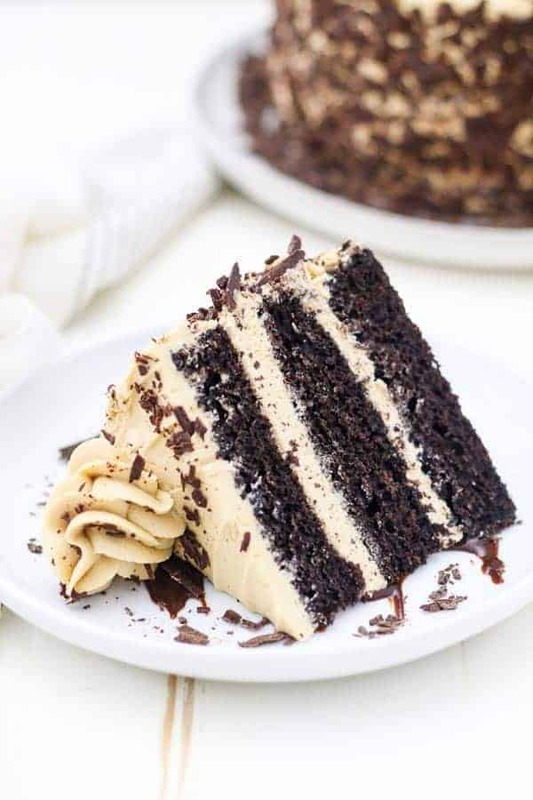 It’s a moist chocolate cake made with a dark brewed coffee and covered in a mocha frosting and chocolate shavings. 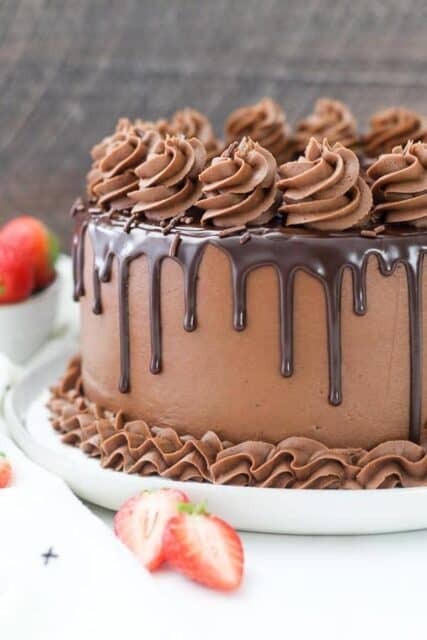 Every bite is so heavenly. 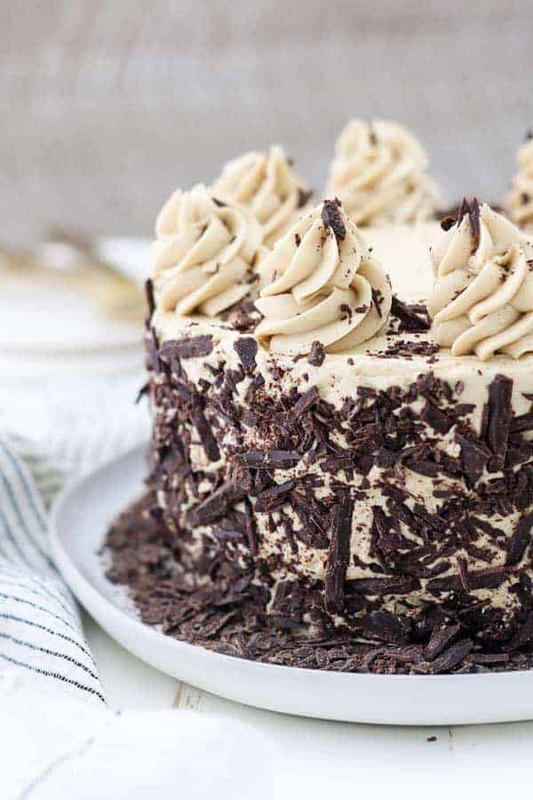 I first made a variation of this frosting when I made my mocha cake with Kahlua buttercream. 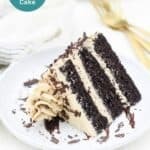 You can absolutely spike your frosting for this cake with Kahlua if you want to, but if you’re looking for a kid friendly version, then just follow the original recipe. The cake itself is super easy. It’s an oil-based cake, so it’s really quick to come together and you can get it in the oven in 10 minutes. When stored properly, it stays moist for several days, and that is in part due to the sour cream in the recipe. I get a lot of questions about substitutions for the sour cream. If you don’t have sour cream, I recommend using a non-fat Greek yogurt. 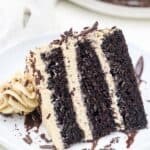 You’ll notice the cake isn’t overly sweet, and it’s more of a mild chocolate flavor that complements a sweeter a frosting. When it comes time to pick a cocoa powder for the cake, I often use Hershey’s special dark cocoa powder, it’s one reason this chocolate cake is so dark. Regular cocoa powder will work as well, but I prefer the dark cocoa myself. 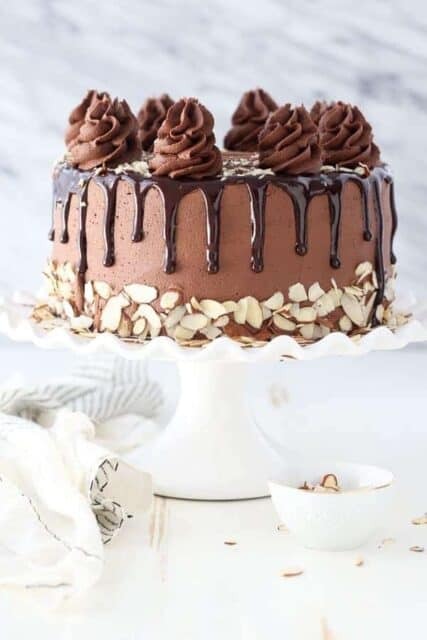 You can bake this cake in three 8-inch rounds or two 9-inch rounds, you’ll just need to adjust the baking time accordingly, and you’ll definitely have some leftover frosting. Personally, I love the look of the 3-layer cake. Once your cake is baked and cooled, it’s time to make the frosting. 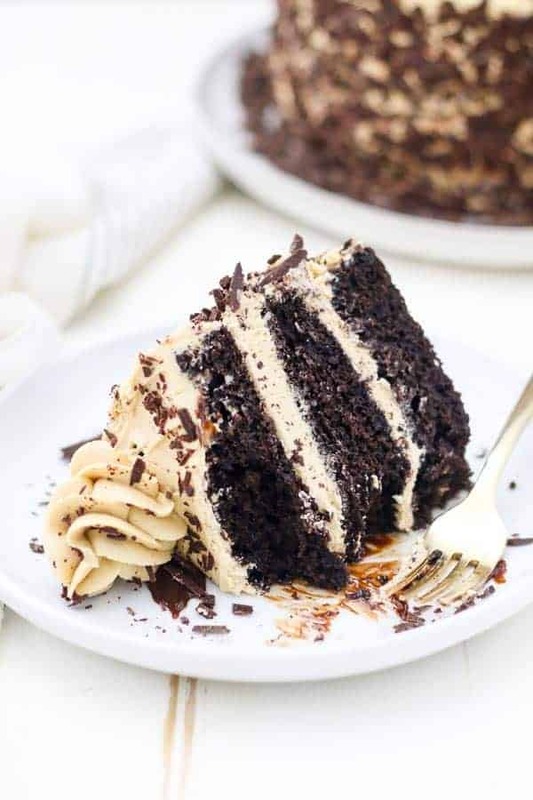 The mocha frosting is so dreamy. It’s whipped to perfection and bursting with coffee flavor. 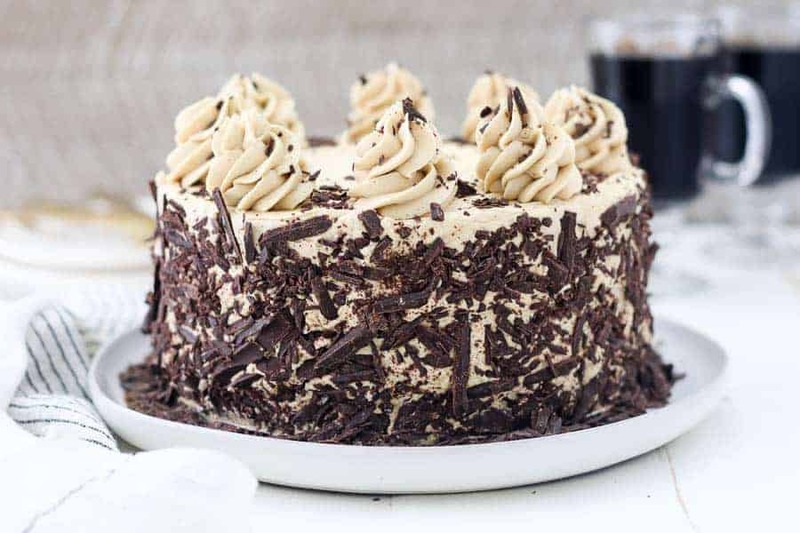 This frosting is flavored with a mix of strong brewed espresso and also powdered espresso. The brewed espresso gives the frosting that toasted brown color and gives a subtle underlying mocha flavor. You’ll brew the espresso with ¼ cup of hot water and 1 tablespoon of espresso powder and then allow it to cool completely. I usually throw it in the freezer. Then measure about 2 tablespoons of the brewed espresso to add to the frosting. Use a pastry brush to spread the leftover espresso on the chocolate cake before you assemble them. Then there’s the espresso powder itself that is added directly to the frosting. This is what gives you the burst of coffee. Without this, the mocha flavor isn’t very strong, so I highly recommend adding it. Assembling the cake is quite easy. I loved adding the chopped chocolate to the outside of the cake. Simply take 4-6 ounces of chocolate and chop it up with a sharp knife. Then press it into the sides of the cake right after frosting the cake. You can use any leftovers to sprinkle on top. 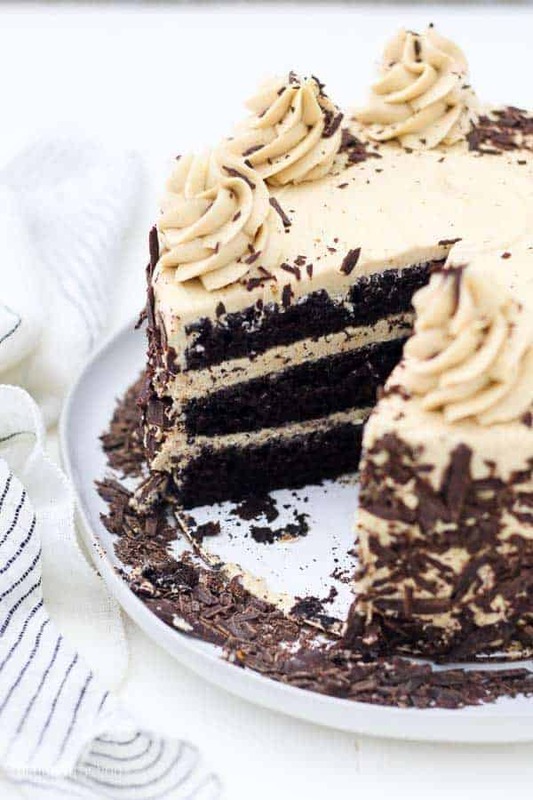 The contrast of the dark chocolate and mocha frosting in this Chocolate Mocha Cake is pure dessert bliss.